Verizon FiOS is the Internet service provided by the Verizon company. This service is bundled with telephone and TV services via a fiber-optic cable network. This branch of Verizon was founded in 2005, and is headquartered in New York City. Verizon uses only fiber optics, rather than a combination of fiber optics, copper, and coaxial cables like many other networks. As of early 2015, Verizon FiOS was providing Internet to over six million households and businesses across the United States. One of the major benefits of fiber-optics is that it offers unprecedented speeds. Some Verizon users can see download rates as high as 500 Mbps, which is incredibly fast. These are speeds that can serve gamers, movie lovers, and music aficionados with nearly zero lag, ever. 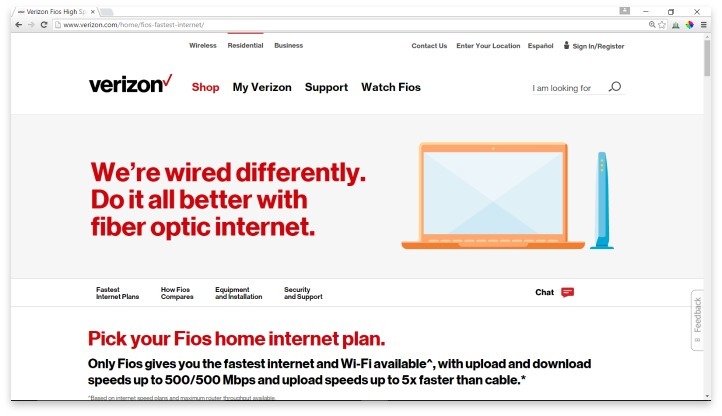 For households that have multiple devices using the Internet at once, Verizon FiOS makes it entirely possible that every device will operate as smoothly as if it were the only one around. Unlike many other Internet service providers, who offer fast download speeds but slow upload speeds, Verizon’s upload speeds range from 5 Mbps to 100 Mbps depending on your plan. Even the most basic plans, at 5 Mbps, are faster than many competitors. Verizon also offers free equipment with their two-year contracts, so users are spared the monthly leasing fee. Third-party reviews consistently show that Verizon has reliable Internet service, and their customer service can be reached through an impressive number of channels. In addition to email, phone, and live chat options, they also have active accounts on Facebook and Twitter where users can contact help, as well as a community forum. The access to 24/7 technical support does require an extra fee, but with so many other support avenues, every user has plenty of chances to seek help. Overall, the biggest downsides to Verizon’s services are the higher prices and their lack of availability. As of right now, FiOS is available in most major cities in the northeast United States, and in most major cities on the western coast of the United States. Everything in between is hit or miss. The monthly service plans start at $50, and go up to $300. However, one major bonus in Verizon’s favor is their low cancellation fee. Users pay just $7.50 per month that they have left on their contract. Additionally, while the package fees are higher than most competitors, there are no bandwidth caps on any of the plans, and each includes download and upload rates that can easily handle quite a lot of regular Internet usage. Users do have to sign up for phone service in order to use Verizon’s DSL Internet service, but the company doesn’t require a credit check or other qualifying information in order to sign up. Verizon provides reliable Internet service with fast download speeds, and their customer service can be reached through an impressive number of channels. If you live in an area where Verizon FiOS is offered, and you need reliable Internet service for heavy use, there is no better choice for you. If you stream a lot of Netflix, game online, or do heavy amounts of reading, research, website maintenance, or operate a business online, Verizon offers the speeds and reliability you need. Unfortunately, if you don’t live in an area where Verizon has fully developed its service, you may find it hard to justify the cost. You would be wise to keep an ear out for news that Verizon has developed more in your area, though, so that you can take advantage of their service in the future. Have you had an experience with this company? Please share your Verizon FiOS reviews below.